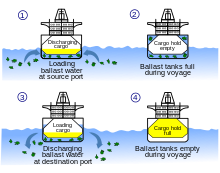 Ballast is used in ships to provide moment to resist the lateral forces on the hull. Insufficiently ballasted boats tend to tip or heel excessively in high winds. Too much heel may result in the boat/ship capsizing. If a sailing vessel should need to voyage without cargo then ballast of little or no value would be loaded to keep the vessel upright. Some or all of this ballast would then be discarded when cargo was loaded. There are disadvantages to using high-density ballast. The first is the increased mass of the boat; a heavier boat sits lower in the water, increasing drag when it moves, and is generally less responsive to steering. A heavier boat is also more difficult to put on a trailer and tow behind an automobile. Secondly, since the ballast needs to be as low as possible, it is often placed into a centerboard or retracting keel, requiring a heavy-duty crank to lift the massive foil. The simplest solution is to use a fixed ballasted keel, but that makes the boat nearly incapable of sailing in very shallow water, and more difficult to handle when out of the water. While prohibited by most class racing rules, some cutting-edge boats use a bulb of ballast on a long, thin keel that can tilt from side to side to create a canting keel. This lets the ballast be placed on the windward side, providing a far greater righting moment with a lower angle of heel. Tilting the keel, however, greatly reduces its lift, so canting keels are usually combined with a retractable centerboard or daggerboard that is deployed when the keel is tilted, and retracted (to reduce drag) when the keel is returned to the vertical. Some canting keels are designed so that when fully extended to either side they have an angle of attack of about 5° allowing the hydrofoil effect of the blade to lift the boat up and reduce wetted surface area for an increase in boat speed. A common type of ballast for small boats that avoids many of the problems of high-density ballast is water ballast. While it seems counter-intuitive that placing water in the hull (which is, after all, close to the same density as the water outside the hull- fresh vs salt water) would add any stability, adding water ballast below the vertical center of gravity increases stability. The water ballast does not need to be lifted above the waterline to affect stability, as any material having greater bulk density than air will have an effect on the centre of gravity. It is the relationship between centre of gravity and centre of buoyancy that dictates the righting moment. The advantage of water ballast is that the tanks can be emptied, reducing draft or the weight of the boat (e.g. for transport on ground) and water added back in (in small boats, simply by opening up the valves and letting the water flow in) after the boat is launched or cargo unloaded. Pumps can also be used to empty the leeward ballast tank and fill the windward tank as the boat tacks, and the quantity of ballast can be varied to keep the boat at the optimum angle of heel. On empty cargo vessels water is added to ballast tanks to increase propeller immersion, to improve steering, and to control trim and draft. A disadvantage of water ballast is that water is not very dense and therefore the tanks required take up more space than other forms of ballast. Some manufacturers offer flexible ballast bags that are mounted outboard of the hull on both sides, and pumps that use the boat's speed through the water for power. When under way, the pump can be used to fill the windward side, while the lee side is allowed to drain. This system, while not very attractive, does allow significant gains in righting force with no modifications to the hull. A trick commonly used on boats with water ballast is to link port and starboard tanks with a valved pipe. When preparing to tack, the valve is opened, and water in the windward tank, which is higher, is allowed to flow to the lee side, and the sheet is let off to keep the boat from heeling too far. Once as much water as possible has been transferred to the lee side, the boat is brought about and the sail sheeted in, lifting the newly full windward tank. A simple hand pump can then be used to move any remaining water from the lee to the windward tank. Cruise ships, large tankers, and bulk cargo carriers use a tremendous amount of ballast water, which is often taken on in the coastal waters in one region after ships discharge wastewater or unload cargo, and discharged at the next port of call, wherever more cargo is loaded. Ballast water discharge typically contains a variety of biological materials, including plants, animals, viruses, and other microorganisms. These materials often include non-native, nuisance, exotic species that can cause extensive ecological and economic damage to aquatic ecosystems. Ballast water discharges are believed to be the leading source of invasive species in U.S. marine waters, thus posing public health and environmental risks, as well as significant economic cost to industries such as water and power utilities, commercial and recreational fisheries, agriculture, and tourism. A recent study suggests that if no action is taken on ballast water management, species invasion can propagate to any port in the world via global shipping network with an average of two intermediate stops. Meanwhile, studies suggest that the economic cost just from introduction of pest mollusks (zebra mussels, the Asian clam, and others) to U.S. aquatic ecosystems is more than $6 billion per year. In case of a bulk cargo ship, there is another environmental effect of ballast water. After unloading the payload a bulk carrier cannot simply return to the starting point, but it must load ballast to get the propeller submerged below water surface. The weight of the ballast increases fuel consumption compared to a hypothetical situation that the ship did not need ballast. A June 2011 National Research Council (United States) study provided advice on the process of setting regulatory limits. The study found that determining the exact number of organisms that could be expected to launch a new population is complex. It suggested an initial step of establishing a benchmark for the concentrations of organisms in ballast water below current levels, and then using models to analyze experimental and field-based data to help inform future decisions about ballast water discharge standards. To minimize the spread of invasive species in U.S. waterways, the Environmental Protection Agency and the U.S. Coast Guard regulate the concentration of living organisms discharged in the ballast water of ships. Wikisource has the text of the 1911 Encyclopædia Britannica article Ballast. This article incorporates text from a public domain Congressional Research Service report: Copeland, Claudia. "Cruise Ship Pollution: Background, Laws and Regulations, and Key Issues" (Order Code RL32450). Congressional Research Service (Updated February 6, 2008). ^ Statement of Catherine Hazlewood, The Ocean Conservancy, “Ballast Water Management: New International Standards and NISA Reauthorization,” Hearing, House Transportation and Infrastructure Subcommittee on Water Resources and Environment, 108th Cong., 2nd sess., March 25, 2004. ^ Xu, Jian; Wickramarathne, Thanuka L.; Chawla, Nitesh V.; Grey, Erin K.; Steinhaeuser, Karsten; Keller, Reuben P.; Drake, John M.; Lodge, David M. (2014). "Improving management of aquatic invasions by integrating shipping network, ecological, and environmental data": 1699–1708. doi:10.1145/2623330.2623364. ^ David Pimentel, Lori Lach, Rodolfo Zuniga, and Doug Morrison, “Environmental and Economic Costs Associated with Non-indigenous Species in the United States,” presented at AAAS Conference, Anaheim, CA, January 24, 1999. ^ Schwarz, Hartmut Berthold (2010-03-13). "Information about modern sailing vessels" (PDF). Sailing Ship Society. p. 11. Retrieved 2014-11-18. The unloaded ship must take ballast water in tanks and in the cargo holds to get the propeller submerged below water surface. This later on causes costs for cleaning and in spite of that, the ship offers a greater resistance than before and will probably need more bunker than for her first destination. ^ Assessing the Relationship Between Propagule Pressure and Invasion Risk in Ballast Water. Washington, D.C.: National Academies Press. 2011. ISBN 978-0-309-21562-6. ^ U.S. Coast Guard, Washington, D.C. (2012) "Ballast Water Management Regulations, 2012." ^ U.S. Environmental Protection Agency, Washington, D.C. (2013) "Vessel General Permit." Wikimedia Commons has media related to Ballast water. Profile- Ballast Water, National Invasive Species Information Center, United States National Agricultural Library. Lists general information and resources for ballast water.